Bathed in light from the setting sun, a young girl laughs easily in the foreground. Three distinct land forms rise up from the sea. The closest, full of heather and grasses is the girls immediate environment. In the middle distance a multi-coloured, multi-faceted land form is an abstraction of the jutting rock. In the distance, land obscured by haze dissolves into the horizon, an unknown space representing the distant future. 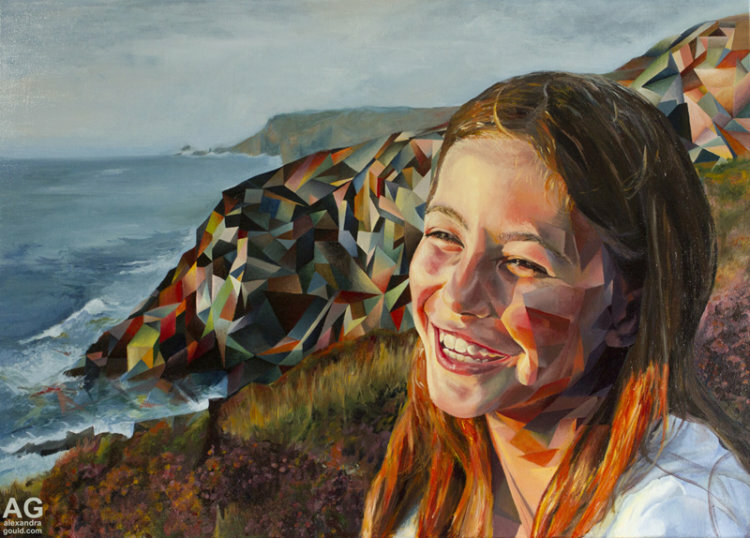 In its realistic depiction, the foreground is tangible but the shifting abstracted shapes in shadows on the girls head resonate with the abstracted land form. They represent the myriad of possibilities already exerting an influence, they are enticing and imminent. A joyful picture, this portrait explores the excitement and inherent complications of parenting.